A constant refrain heard from conservatives for decades is that American corporations are at a competitive disadvantage to foreign competitors due to high U.S. corporate tax rates. Panderbear has a one word reply to that claim. "Bull!" This claim by Republicans is totally disingenuous, because of the difference between high theoretical marginal tax rates and what corporations actually pay. After all the special deductions, dispensations, and loopholes, effective U.S. corporate tax rates are among the lowest in the world. The fact that American corporations continue to dominate the world economy belies the Republican claim that they are at a disadvantage. The real bottom line is not what the theoretical tax rates are, but what rates are actually paid. 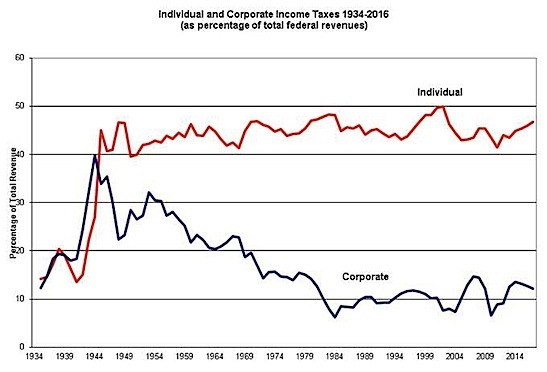 The chart shows that ever since WWII when individual and corporate percentage contributions to government revenues were approximately equal, corporations have received increasingly favorable tax treatment compared to individuals. At the end of the war corporate and individual income taxes each constituted about 40% of federal revenues. The corporate share has decreased over the decades to roughly 10% while individuals are contributing close to 50% percent. Instead of contributing equally individuals now subsidize corporations by a 4 to 1 ratio. Panderbear thinks the data expose Republican claims regarding high corporate tax rates as obvious panders. U.S. corporations are currently getting a virtual free ride at the expense of individual tax payers. This is one more factor contributing to increasing income divergence and a growing wealth gap. If corporations can enjoy the legal status of persons, they should pay the same tax rates. What's the other source of revenue for the federal government? In 1935 when both individuals and corporations constituted about 15% of total revenue, where did the other 70% come from? When I look at that chart I see something that I wasn't expecting. The change from equal in the mid-40s to now isn't steady at all as claimed in the article. The change is almost entirely within the period between WWII and ~1980. If you look since 1980 the lines for both are pretty stable: within a band of 5% either way of 45% for individuals and a similar band around 10% for corporations. I'm not what to make of that. You are correct to point out the apparent inconsistency between the chart and the "steady change" statement. If you add in payroll taxes, which are in fact federal revenue, the case for steady change is a big stronger. Nevertheless, I take your point. To my eye the the ratio of individual to corporate tax revenues peaked in 1984, 3 years into Reagan's first term, in 2003, 2 years into Bush II's first term, and then plunged with the onset of the Great Recession. So we can attribute the peaks to the Republican administrations and the dips to a Democratic president, Clinton, and to a recession. Thanks for leading me to take a closer look. All very interesting. It would be interesting to see a 1%/99% breakdown on corporate tax rates. Are a handful of big bucks companies both bringing down the average, and enjoying a competitive advantage due to the higher taxes their poorer brethren pay? Reducing the top rate and broadening the base is still a good idea, but it should be done in conjunction with an overall increase in federal tax revenue from the corporate sector.